I've been working for the last six months or so with my colleague Dr. Jonathan Golob on an algorithm to help analyze microbiome samples, and now it's ready to share with the world. If you'd like to read a preprint of the paper instead of this blog-based summary, you can do so on bioRxiv. As we were analyzing a set of microbiome samples using shotgun genomes sequence data (WGS), we kept running into a tricky problem. Our goal was to identify the set of protein coding genes present in a sample, and so we aligned the WGS reads using DIAMOND against the UniRef90 database and took the best hit(s) for each read. 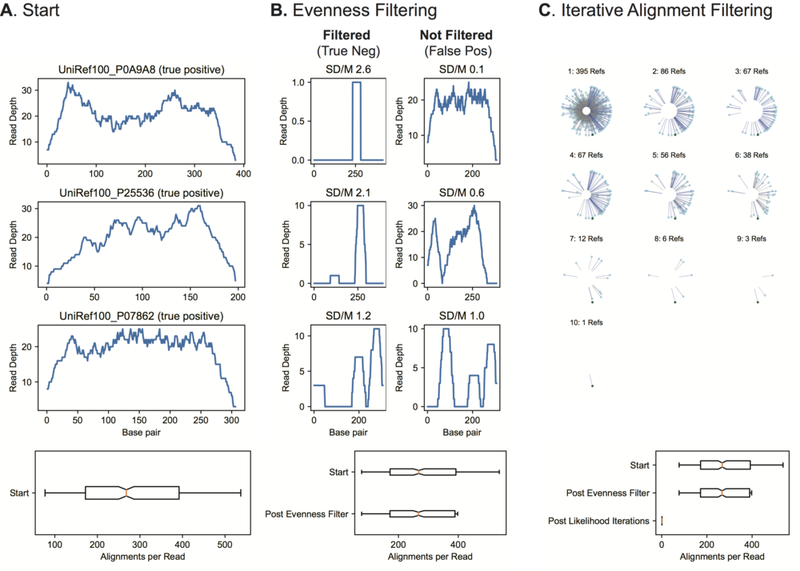 However, we kept getting all sorts of false positives and false negatives, which we ultimately figured out were due to a) sequencing error and b) large regions of identical protein sequence shared between different proteins in the database. In fact, (b) was far more concerning to us than (a) because it meant that we were doing better or worse depending on the quality of annotation for an organism's genome. This was an analytical bias we didn't want in our research. Filter the final set of protein references as in (2), using the deduplicated alignments from (3). We did some work to test how this approach compares to other potential options, and we think it does quite well. You can read the paper for more details on that. We would like for this approach to be generally available for use by the research community. You can read the source code on GitHub, you can download a Docker image from Quay, and you can install directly from PyPI. Of the three, I suggest you just use the Docker image to minimize any confusion or unpredictability. As we worked on benchmarking this algorithm we felt that it was necessary to compare it with other existing methods that are used by the community, but I didn't want to give the impression that this algorithm is intended to replace or supplant any previously existing tools. That's because the goal of this analysis is subtly different than that of other methods. To date, functional metagenomics has generally had the goal of identifying the metabolic pathways encoded by a community (e.g. HUMAnN2) or identifying the complete gene catalog that can be assembled from a community (e.g. de novo assembly). I think that both of those methods work very well for those useful purposes. In contrast, FAMLI attempts to quantify the set of protein-coding genes from a closed reference database (e.g. UniRef90), whether or not they have any annotated metabolic function. In fact, one of the more interesting possibilities would be to incorporate this open source algorithm into those existing tools, using it to optimize any alignments that are created as part of a larger pipeline. If you are a tool maker and are interested in working on that together, please be in touch. Working on this project has been an extremely challenging and rewarding process, full of false starts, confusion, and discovery. I cannot be more thankful to Dr. Jonathan Golob for his equal contribution to this effort, and am also thankful for any readers who have been interested enough by our work to read this far. I hope that you find some utility from our efforts.